This was a real treat, and an interesting balance between the experience of Many Circles – mind-bending, challenging, slow work – and If You Knew Then What I Know Now, which I read with pleasure in one big gulp. Violation was different from each of those, but fell just between them in its pacing. I was engaged and felt a sense of momentum throughout, but also had to stop and sit with what I was learning, or to react. 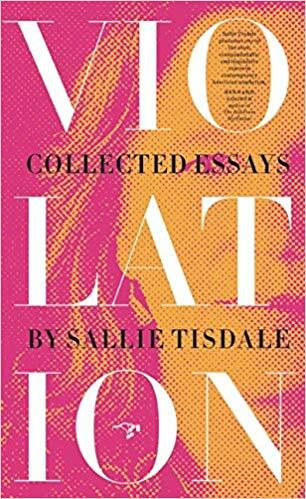 These essays span thirty years of Sallie Tisdale’s writing career, and are presented in the order in which they were published, with the final essay previously unpublished. Some of them were in progress for years before publication, but still a chronological order of a sort. While subject matters range quite a bit – elephants, flies, abortion clinics and cancer hospitals, sports, childhood and motherhood – they clearly track the evolution of one mind. Tisdale is a Buddhist, although that doesn’t come up as an explicit fact til late in the collection. She is an artist, passionate, but practically minded. She is concerned with the body, and with feminism, in different ways. I enjoyed very much getting to know her in these essays; but I also have an impression of her as a very private person, and in some ways don’t think I really got to know her very well at all. The introduction gave me my first moment of aha! simpatico joy: “Long before I knew how to describe it, I liked ambivalence. Certainty has always seemed a bit dishonest to me.” This is so much what I feel, and it’s perhaps something I’m still working on describing, myself. It was my first, early signal that I would get along with this writer. I really enjoy her style. She is the essayist’s essayist, or these are examples of the classical essay-as-assay: the mind wanders on the page. She is curious. She brings in a huge amount of outside research, sometimes, as when she writes about elephants and moray eels. She reminds me of Annie Dillard in the combination of immediate personal experience with science, but without the raving exuberance that Dillard often brings. Instead, Tisdale remains calm. On the other hand, the title essay is about the memoirist’s famous problem: family responses to one’s work. The nature of memory, and the question of what is ours to write about. More purely personal essays like this one require little or no research. These essays are concerned with art and creativity, yearning, body image, and what boys and girls were allowed to do (and still are and are not allowed to do)… so many things, but not all at once. They take on really different things. And while most are alike in basic structure – discrete essays, with narrative journeys and mountains to climb and points unto themselves – one of the ones that most struck me was the segmented essay “Scars,” published in 2003, about raising a son. I loved the wordplay (of each segment’s title) and the enormous scope in a small package (just over 7 pages total). It spans a lot of time: sections are labeled with years from 1982 to 1997, and a brief note at the end says that the first section, in its original draft, was one of the first essays Tisdale wrote. I really appreciated seeing the bones of this one a little bit. And then, immediately following, comes “On Being Text,” about what it’s felt like as a writer to be included in anthologies that teach literature or writing: to read what’s said about her and about her methods and intentions. (It’s not all good.) This juxtaposition helped me again to appreciate the range in this collection. But definitely some of my favorite essays were the two about elephants, “The Only Harmless Great Thing” and “The Birth.” The first, early in the collection (1989), is over 40 pages long, and brings in an enormous amount of scientific and historical information about elephants and zoos, and calls as well on literature and myth. It’s also personal: the narrator feels lucky to have gained back-room access to the elephants at Portland’s Washington Park Zoo. The elephants are magic, and she writes about them beautifully. This was an essay I snuggled into, fascinated and comforted by these strange creatures so loved and respected. And then “The Birth” (2003), under ten pages, and tender and very much in-the-moment; it handles the same setting and the same (elephant and human) characters, but easily stands alone from the earlier essay too. “Elephants are so outside the size of things.” They “held up the world.” As she later does with the moray eel, Tisdale insists upon a distance from these animals: she acknowledges the temptation to feel close, to anthropomorphize, but holds herself to appreciating their otherness too. These essays are dreamy. Tisdale is curious, thoughtful, considerate, and honest. I’m so glad that she allows this curiosity and careful consideration to range over the wide, wide world. (I didn’t even get into the lengthy treatise, “The Sutra of Maggots and Blowflies,” about much-maligned insects and Buddhism.) This was a treat, and I highly recommend it for curious readers of all kinds. Rating: 8 sheep bot flies. I read Stepping Westward many years ago and loved Tisdale’s essays. Like you, I felt comfortable with them. It was one of the first book of essays I ever read and I was intrigued with her subject matter, the Pacific Northwest, being a fairly new transplant from the East at that time. Thanks for reviewing this book. I will check it out. Hi, Ilona. I love it when things like this work out. I’m glad you’ve enjoyed Tisdale, too. Books can help us with places (moves, life).